The Allegheny River is located in the Northeastern United States and is a principal tributary of the Ohio River. The river rises in Pennsylvania and flows north into New York, and south into Pennsylvania again joining with the Monongahela River in the middle of Pittsburgh. Pittsburgh developed at this confluence. The Allegheny and the Monongahela confluence is the beginning of the Ohio River. The Allegheny's largest tributaries are the Kiskiminetas, Clarion, and Conemaugh rivers and the Red Bank, Oil, and French creeks. Its tributaries reach to within 8 miles (13 km) of Lake Erie in southwestern New York. 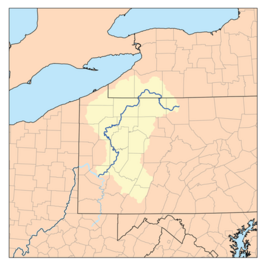 The river is approximately 321 miles (517 km) long, and drains a rural dissected plateau of 11,580 square miles (30,000 km²) in the northern Allegheny Plateau, providing the farthest northeastern drainage in the watershed of the Mississippi River. The valley of the Allegheny River is one of the most productive areas of energy extraction in U.S. history, with extensive deposits of coal, petroleum, and natural gas. In 1992, 86.6 miles (139.4 km) of the Allegheny River was designated a National Wild and Scenic River. This designation comprises three segments of the river located in Warren, Forest and Venango Counties. Seven islands in the river located between Kinzua Dam and Oil City, total 368 acres (1 km²), comprise the Allegheny Islands Wilderness, the smallest federally designated wilderness area in the United States. These designations have been made due to the significant ecological, scenic and recreational features of the river. The word Allegheny comes from the Lenape (Delaware) Indians. Although it is usually translated as "fine river," the meaning is not definitively known. There is a Lenape legend of a tribe called "Allegewi" who once lived along the river. Other Native Americans, such as the Iroquois, considered the Allegheny and Ohio rivers to be one and the same. Areas around the river, especially in New York state, are often named with an alternate spelling Allegany in reference to the river, such as the Village of Allegany, New York. The Allegheny rises in north central Pennsylvania, in central Potter County, approximately 10 miles (16 km) south of the New York border. It flows west past Coudersport then turns north into western New York State, looping westward across southern Cattaraugus County for approximately 30 miles (48 km), past Portville, Olean, St. Bonaventure University, and Salamanca and forming the northern boundary of Allegany State Park before re-entering northwestern Pennsylvania approximately 20 miles (32 km) southeast of Jamestown, New York. It flows in a broad zigzag course generally southward across western Pennsylvania, first flowing southwest past Warren, Tidioute, Tionesta, Oil City, and Franklin, forming much of the northwestern boundary of Allegheny National Forest. South of Franklin it turns southeast across Clarion County in a meandering course, then turns again southwest across Armstrong County, flowing past Kittanning, Ford City, Clinton and Freeport. It enters Allegheny County, the Pittsburgh suburbs, and the City of Pittsburgh from the northeast passing Sligo, Karns, and Natrona in Harrison Township, then Braeburn, Lower Burrell, Brackenridge, Tarentum, Creighton, Clyde, New Kensington, Springdale, Harmarville, Blawnox, Fox Chapel, Sharpsburg, Etna, Millvale, Lawrenceville, Highland Park, The North Side, Downtown Pittsburgh, Point State Park and joins with the Monongahela River at "The Point" in Downtown Pittsburgh, Pennsylvania to form the Ohio River. Water from the Allegheny River eventually flows into the Gulf of Mexico via the Ohio and the Mississippi Rivers. Much of the area through which the Allegheny River flows consists of hilly woodlands. 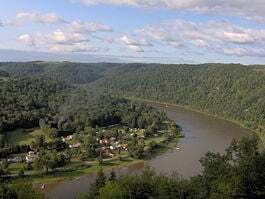 In its upper reaches the Allegheny is joined from the south by Potato Creek in McKean County, Pennsylvania and from the north by Olean Creek at Olean, New York. The Great Valley Creek and Little Valley Creek join the river from the north in Salamanca, New York before becoming the Allegheny Reservoir. After re-entering Pennsylvania, it is joined from the east by Kinzua Creek 10 miles (16 km) upstream of Warren; from the north by Conewango Creek at Warren; from the west by Brokenstraw Creek; from the north by Oil Creek at Oil City; from the west by French Creek at Franklin; from the east by the Clarion River in Parker, Pennsylvania, one of its principal tributaries, in eastern Clarion County; from the east by Crooked Creek southeast of Kittanning; and from the east by the Kiskiminetas River, another principal tributary, at Freeport. Buffalo Creek enters at Freeport, Bull Creek enters at Tarentum. There are numerous other creeks, runs, and streams that enter or join with the Allegheny River. 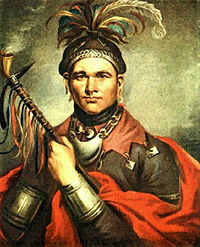 Chief Cornplanter of the Seneca nation, who lived along the Allegheny River. Portrait by F. Bertoli, 1796. In the sixteenth century, control of the river valley passed back-and-forth between Algonquian-speaking Shawnee and the Iroquois. By the time of the arrival of the French in the early eighteenth century, the Shawnee were once again in control and formed an alliance with the French against the incursion of British settlement across the Allegheny Mountains. The conflict over the expansion of British settlement into the Allegheny Valley and the surrounding Ohio Country was a primary cause of the French and Indian War in the 1750s. During the war, the village of Kittaning, the principal Shawnee settlement on the river, was completely destroyed by British reprisal raids from Central Pennsylvania. Nevertheless, the British, after gaining control of the area in the 1763 Treaty of Paris, kept the area closed to white settlement, in part to repair and maintain relations with the Native Americans. The pressure to open the river valley and the surrounding area to settlement is considered by historians to be one of the root causes of the American Revolutionary War in the following decade. During the nineteenth century, the river became a principal means of navigation in the upper Ohio valley, especially for the transport of coal. Although the building of the railroads lessened the importance of the river somewhat, the lower river (navigable as far as East Brady, Pennsylvania through locks) has continued to serve as route of commercial transportation until the present day. In 1859, the first U.S. petroleum was drilled north of the river at Titusville. Lock and Dam No. 2 on the Allegheny River in Aspinwall, Pennsylvania. The Highland Park Bridge crosses the river just above the dam. Many prominent individuals opposed the construction of the dam at that time because of the damage it would do to Seneca lands, including Pennsylvania Congressman John P. Saylor of Johnstown, and Howard Zahniser, executive director of The Wilderness Society and native of Tionesta, Pennsylvania—a small town located on the Allegheny River several miles downstream of Warren. During the campaign for the 1960 United States presidential election, John F. Kennedy assured the Seneca Nation that he would oppose the dam if elected. However, he failed to follow through on his pledge upon becoming president. The construction of the dam and the filling of the Allegheny Reservoir also necessitated the elimination of the small town of Corydon, which was located at the confluence of Willow Creek with the Allegheny River, and the small town of Kinzua, which was located at the confluence of Kinzua Creek with the Allegheny River. All residents of both towns were forced to move. 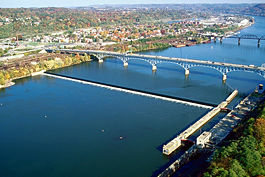 The Allegheny (left) and Monongahela (right) join to form the Ohio River at Pittsburgh, Pennsylvania. National Wild and Scenic River is a designation for certain protected areas in the United States. In 1992, 86.6 miles (139.4 km) of the Allegheny was designated Wild and Scenic. This designation comprises three segments of the river located in Warren, Forest and Venango Counties. According to the National Wild and Scenic Rivers Act, a river or river section may be designated by the U.S. Congress or the Secretary of the Interior on the belief that development of that river would substantially and adversely affect its wild or scenic nature. Rivers selected for preservation under this status are deemed to be of remarkable scenic, recreational, geologic, fish and wildlife, historic, cultural, or other similar values. These rivers are preserved in their free-flowing condition and are not dammed or otherwise impeded. Designation as a wild and scenic river is not the same as designation as a national park, and does not generally does not confer the same level of protection as a Wilderness Area designation. Instead of enacting mandatory conservation measures, the goal is generally to preserve the character of the river. Scenic Values—narrow, sharply winding valley with 17 district focal landscapes and strong spatial enclosure in the lower reaches. River Islands—over 100 islands between Kinzua Dam and Oil City with significant ecological, scenic and recreational features. Seven of these islands, totaling 368 acres, comprise the Allegheny Islands Wilderness, the smallest federally-designated Wilderness in the United States. Cultural Values—approximately 135 potentially significant historic and prehistoric sites, in addition to four sites already on the National Register. 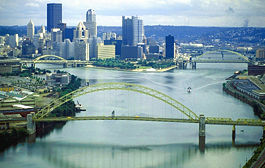 Pittsburgh, where the Allegheny River meets the Monongahela to form the Ohio River, is the only major city on the Allegheny, though there are more than 75 smaller communities along its course. In the 1950s, the problems in the Allegheny River were high iron content, high manganese and very low pH levels. These issues have improved significantly. The river was so polluted at that time that there were few species of fish surviving. Today there are more than 70 species, including freshwater mussels, known to be among the most sensitive of river organisms. Federal laws, including the Clean Water Act of 1972, created to make waters fit for fishing and swimming by eliminating polluted discharges, and the Surface Mining Control and Reclamation Act of 1977, requiring the treatment of drainage from active mines, played a huge part in the cleaning up of Pennsylvania's rivers. Combined sewer overflows—Storm water mixes with raw sewage in local sewers, overwhelming treatment facilities and flowing into the river. Abandoned mine drainage—Groundwater passes through the mines, picking up acid and metals, and carries them into the watershed. Eventually, the pollutants spill into streams and rivers. Persistent toxins—Polychlorinated biphenyls, or PCBs, and mercury from past unregulated factory discharges, and the agricultural pesticide chlordane still rest at the bottom of Western Pennsylvania's creeks, streams and rivers. When fish ingest the toxins, they build up in their fat and organs and ultimately make their way up the food chain to birds and humans, where they cause numerous ailments, including cancer. There are a number of organizations working to clean up the pollutants that remain a threat to the Allegheny, Ohio and Monongahela rivers and their tributaries. The EPA and the Allegheny County Sanitary Authority are devising ways to stop sewage overflows that occur after heavy rains. Groups such as the Allegheny Land Trust are designing and building treatment systems to remove acids and metals from abandoned mine drainage before they poison streams and rivers. Researchers at Carnegie Mellon University are testing several ways to neutralize PCBs, and prevent them from entering the river food chain. In addition, the Ohio River Valley Water Sanitation Commission, an eight-state nonprofit corporation created by the U.S. government, is investigating whether water quality data should be more easily accessible to the public. "Making sure the public can access and understand the data would help federal lawmakers get money to fix problems," said Peter Tennant, the commission's deputy executive director. ↑ USDA Forest Service, Allegheny National Forest. Retrieved January 10, 2009. ↑ 2.0 2.1 Allison M. Heinrichs, July 3, 2005, On the waterfront, Tribune-Review Publishing Company. Retrieved January 23, 2009. Schafer, Jim, and Mike Sajna. 1992. The Allegheny River: Watershed of the Nation. University Park, Pa: Pennsylvania State University Press. ISBN 9780271008363. Stewart, George Rippey. 1979. American Given Names: Their Origin and History in the Context of the English Language. New York: Oxford University Press. ISBN 9780195024654. United States. 2004. Allegheny River Navigation Charts: Pittsburgh, Pennsylvania to East Brady, Pennsylvania. Pittsburgh, Penn: U.S. Army Engineer District. OCLC 56128877. USDA Forest Service. Allegheny Wild and Scenic River. Retrieved January 7, 2009. Williams, Charles E. 2006. Along the Allegheny River: The Southern Watershed. Postcard history series. Charleston, SC: Arcadia. ISBN 9780738538464. This page was last modified on 5 March 2019, at 23:46.